“I haven’t been out that late at night for a long long time!” Jeffrey tells us of his trip to the theatre with ACE Neighbours volunteer Anne. With no local family or friends and feeling detached from his neighbours and community, Jeffrey wanted some help to build his confidence to “get out and about and enjoy life”. Anne was keen to volunteer with older people after a lifetime of working with children: “I wanted to give my time and energy to someone who would benefit” and so became an ACE Neighbours volunteer. Jeffrey was referred to the ACE Neighbours project. The project, run by Bristol-based charity the St Monica Trust, aims to reduce loneliness and isolation in older people. Connecting with people and taking part in activities can make all the difference but it can be a bit daunting going out to something on your own so not surprisingly most people would prefer to have someone to go with. This is where ACE Neighbours can make a difference. 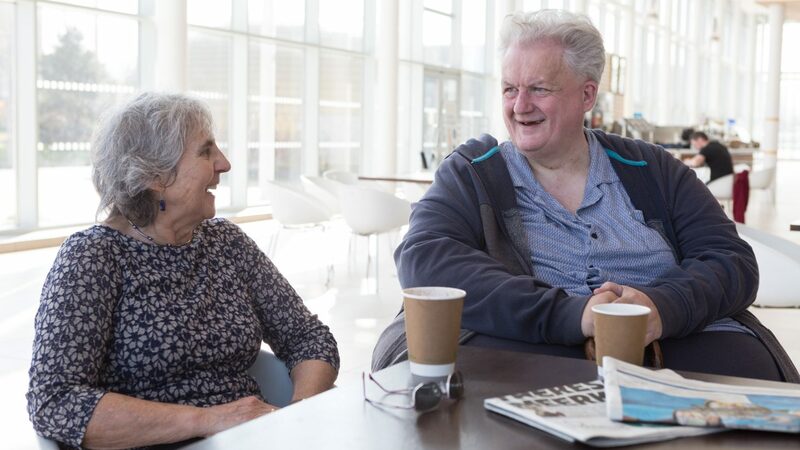 A volunteer is matched with an older person experiencing loneliness and together they can try things until the person feels confident getting out and about on their own. ACE Neighbours arranged for Anne to visit Jeffrey. Anne gave Jeffrey a purpose to leave the house by using information on local activities and planning which ones to try out. Jeffrey said: “I needed a buddy; someone who I could go out and meet for a coffee. Before Anne started visiting me, life was dark. I wasn’t active. I plodded on from day to day. At Anne’s first visit we talked and talked. We talked about anything and everything and felt at ease in each other’s company”. Jeffrey now has a structure to his week and most importantly, has the social contact he was lacking previously. Anne enjoyed her volunteering greatly and although the 6 month period of support has come to an end, Anne and Jeffrey’s friendship hasn’t. They have plans to visit a garden centre, the museum and are looking forward to an upcoming cinema trip. Do you know an older person (aged over 65) who is experiencing loneliness, is lacking in confidence to get out and about and would like someone to help them choose an activity or two – and go along with them for moral support? If so, get in touch with the project. The project covers Hartcliffe, Withywood, Filwood, Lawrence Hill and Keynsham but it’s always worth getting in touch to see what help is around. The project is also in need of friendly and enthusiastic volunteers over the age of 60. Are you interested in supporting someone to connect with things going on in their area for 6 months? It would take 1 or 2 hours per week initially but this would reduce in time over the 6 months. Volunteers receive training, on-going support and all expenses are paid. If you’d like to know more about the ACE Neighbours project, contact Catherine on 07817 632963 or catherine.robinson@stmonicatrust.org.uk. Like our Facebook page https://www.facebook.com/StMonicaTrustIntheCommunity to keep up to date with other ACE Neighbours stories and all St Monica Trust community projects.